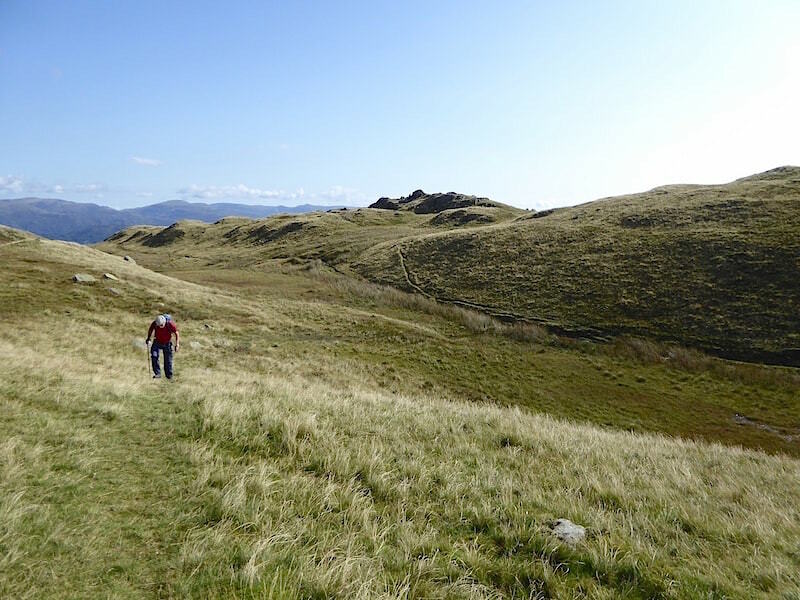 We’ve had a number of low level walks just recently so, as it was supposed to be a good weather day today with no rain or strong winds showing up in the forecast, we decided that getting out and doing a higher level walk would be a good way of making use of the fine weather. 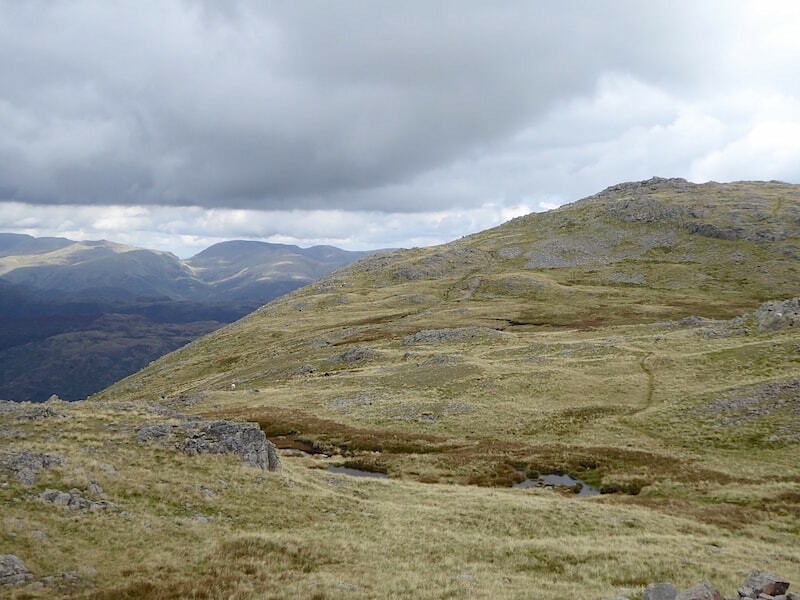 We looked at a variety of options but for no special reason decided on Wetherlam making our descent via Red Dell. The forecast didn’t quite live up to its billing but it was a reasonable day, considering the largely rubbishy ones that have been inflicted on us all too often during this summer season. 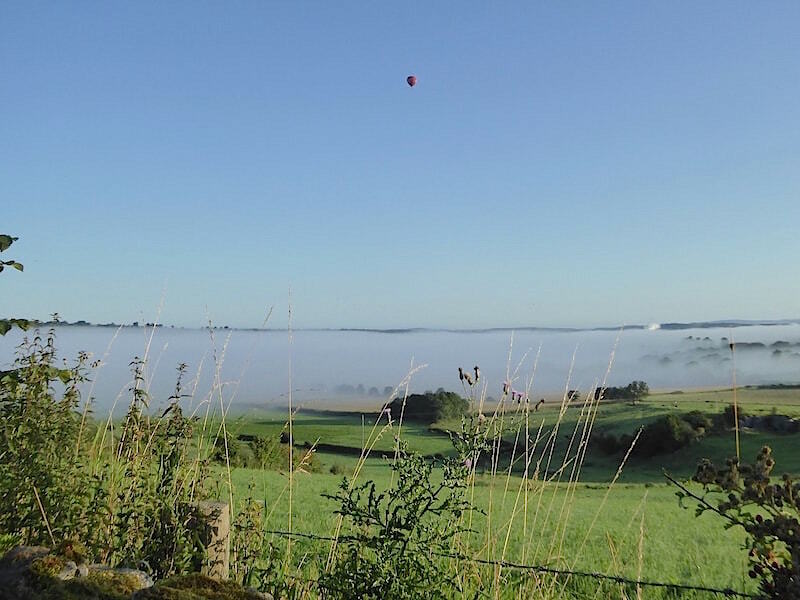 Below are a couple of shots taken as we began the drive to Coniston …..
An extensive inversion across the low lying valleys between Yanwath and Tirril, and a ballonist taking full advantage of the very still morning, as we make our way over to Pooley Bridge …..
….. where the inversion extended along Ullswater. 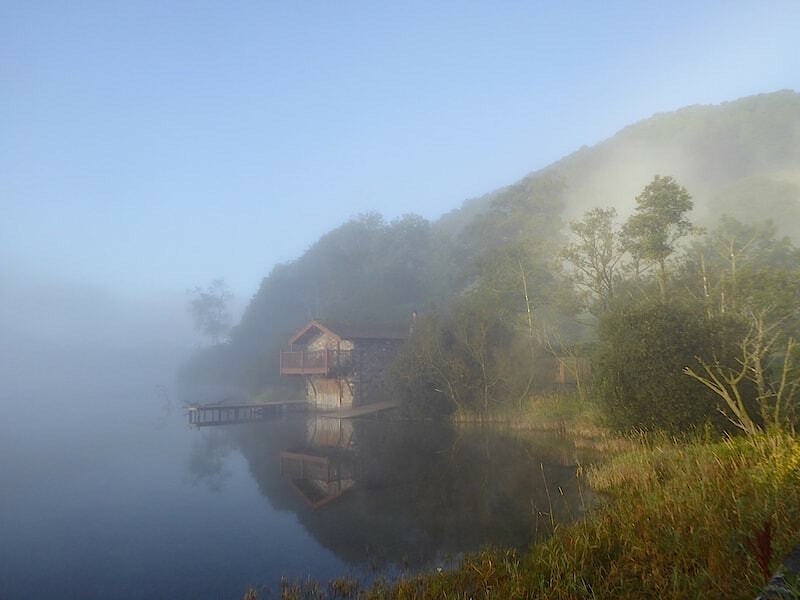 The Duke of Portland boathouse and its surrounding looking distinctly other worldly in the morning mist. 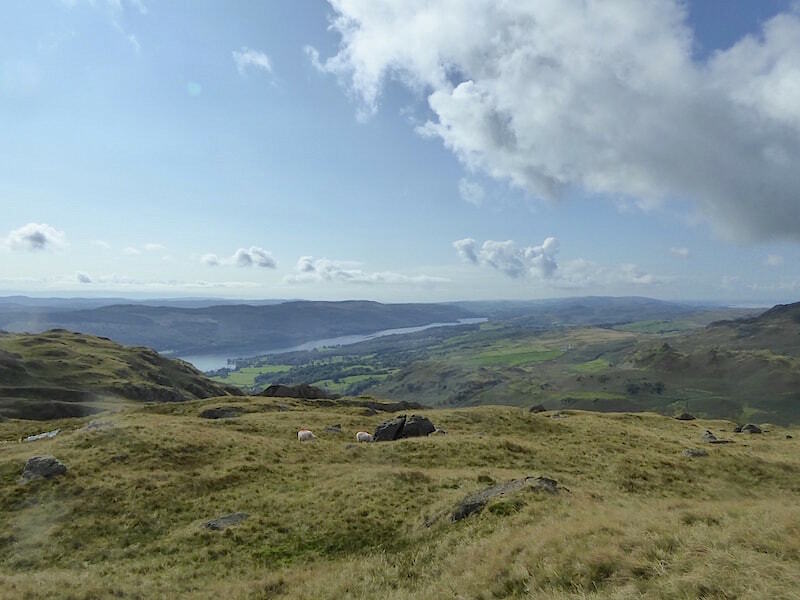 We had made an early start so there was little traffic on the roads and we arrived in Coniston in good time. 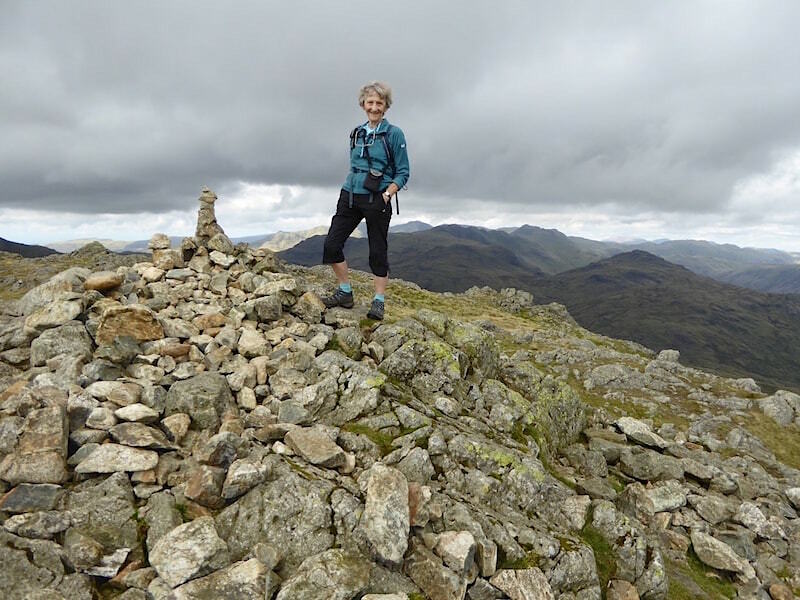 We parked at the top of the road leading up from the Ruskin Museum and before setting out tucked into the breakfast we had brought with us, bacon butties and hot coffee being just the thing to set you up for the long uphill walk to the summit of Wetherlam. We were the only car parked so there were very few people around, just a dog walker or two, and holidaymakers loading luggage into their cars ready for the journey home and their return to routine and normality. 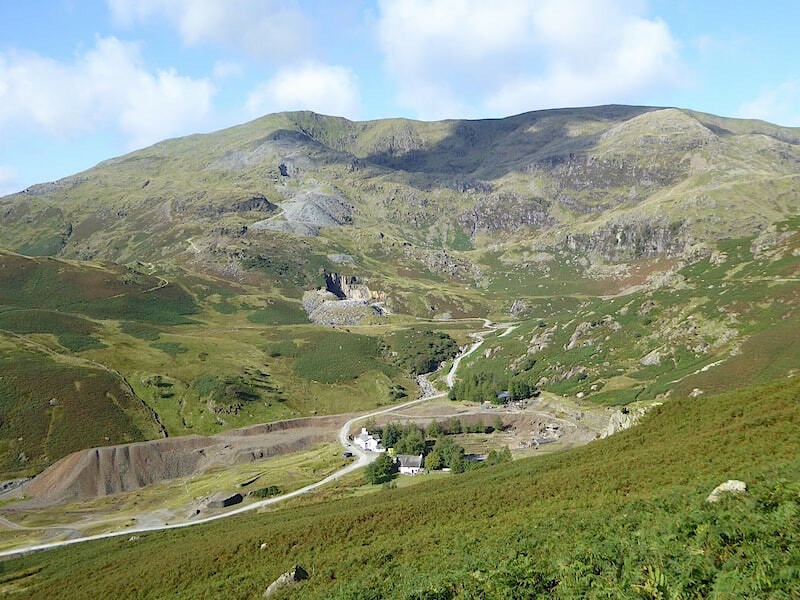 After kitting up we headed up the old quarry road making our way to …..
….. the Coppermines Valley, once a place of intense industrial activity but now home to self catering holiday cottages and the Coppermines YHA which is the white building in the centre. Just off to the right of the shot we leave the valley road and turn up the old quarry track and begin the climb. 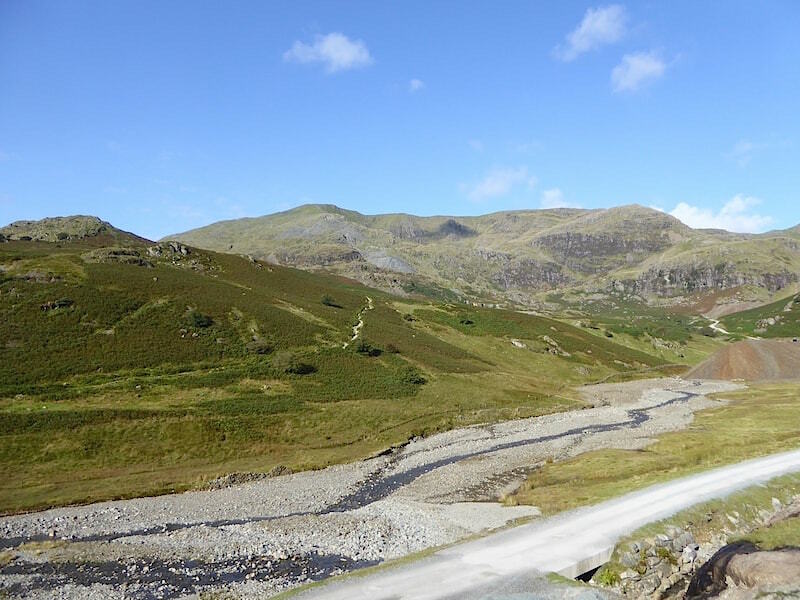 You don’t have to climb very far before Coniston Old Man comes into view across the Coppermines Valley. 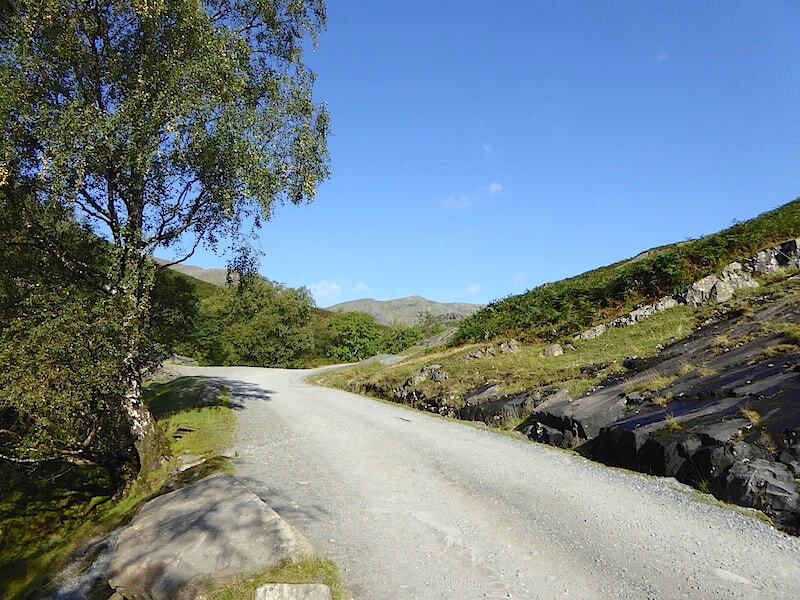 The track straight ahead is just an access road for the Coppermines Cottages, which were once occupied by Irish miners and so became known as Irish Row, but which are now self catering holiday accommodation. We turn off to the right to continue our climb. Its a lovely warm morning with not a hint of breeze so we’re at t-shirt level right from the start. As we continue along the track we begin to get a view down into Red Dell. 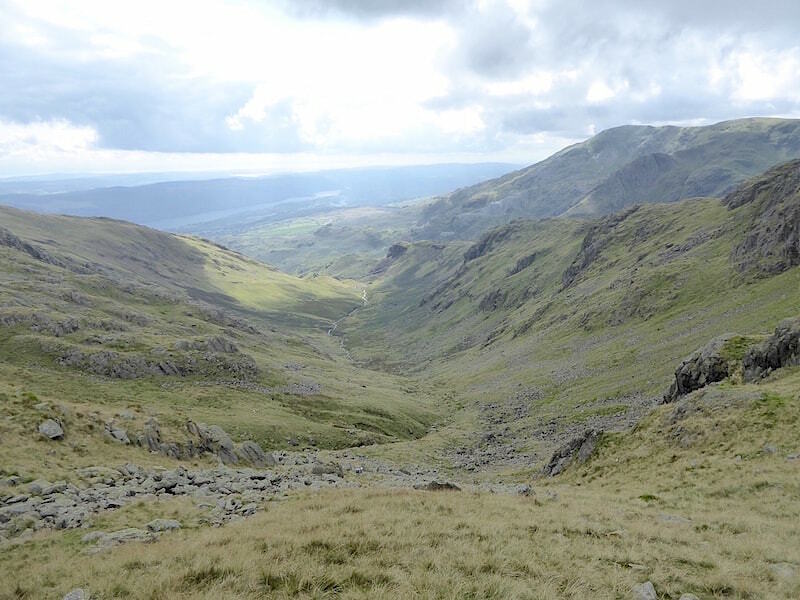 the valley below the left of centre skyline, below which is the craggy ridge leading up to Black Sails. 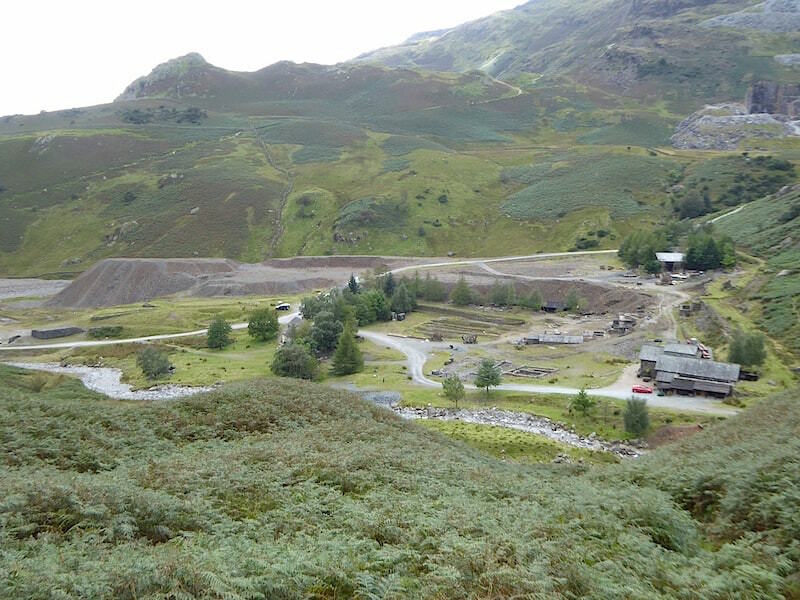 We plan to return via Red Dell and have a good look around the old mining area. 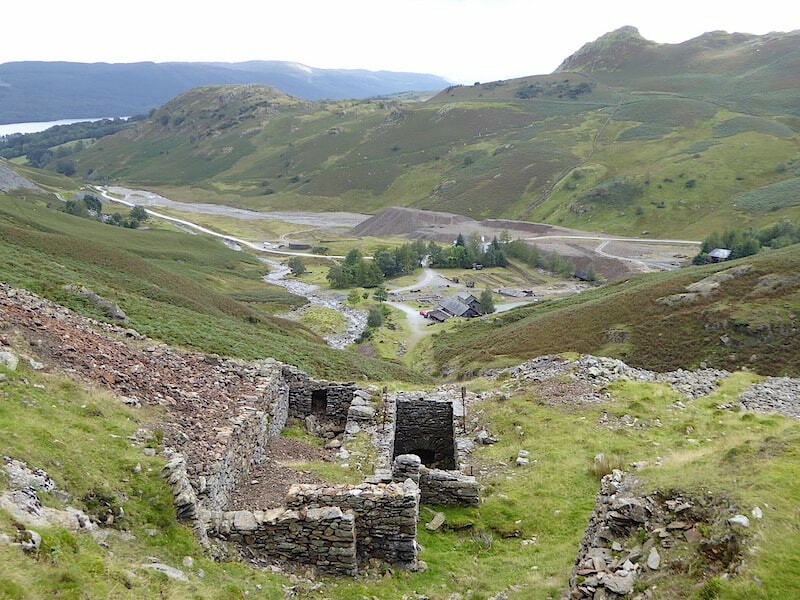 A little further up the track and the extent of the copper mining activity, which first began towards the end of the 16th century, possibly even earlier, becomes apparent. 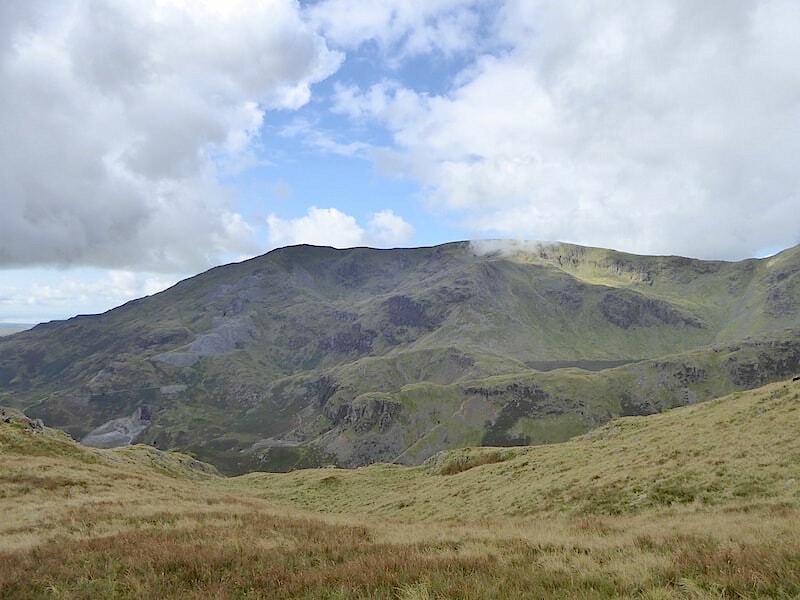 The slopes of Coniston Old Man are pitted with shafts, levels, quarries and tunnels and dotted with heaps of spoil and I hope there is never a plan to ‘prettify’ it and turn it into some kind of Disneyworld theme park. Amongst the bracken, to the left of the Irish Row cottages, is another path junction just below the small hill with the sunlight on the left of it. There we follow the track round to the right, alongside the sunny side of the hill, and then turn left at the next junction to follow this rough path upwards. The Red Dell route we will return on later will eventually lead us back to this junction from where we’ll drop back down to the gravel road you can see running along the valley. We carry on past the Hole Rake turn off, which we’ve used before, and continue on to the next path, where we take a left turn to follow this one. Both paths eventually join, so its six of one and half a dozen of the other, and each one becomes a little squelchy at times. 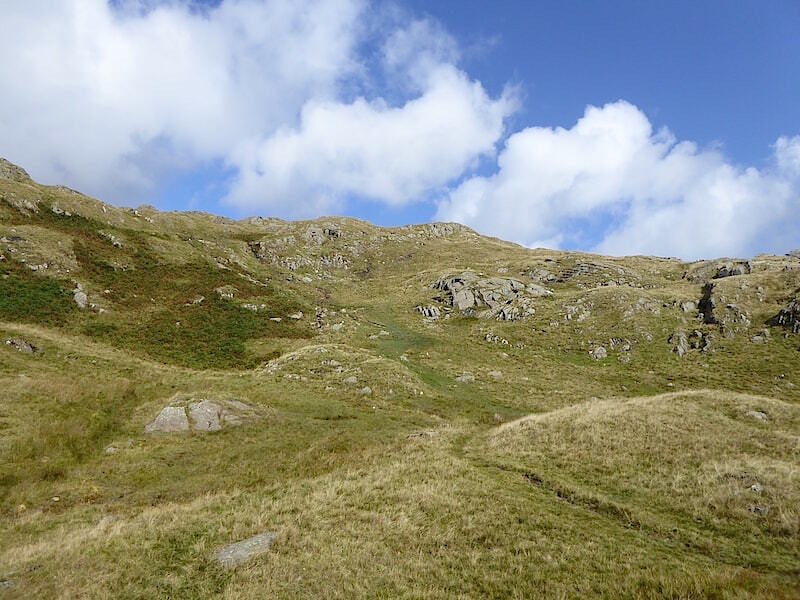 The main path continues through the rocky outcrops on its way to Tilberthwaite, and I take a look back down as we continue over this one on our way up to the top of Wetherlam. 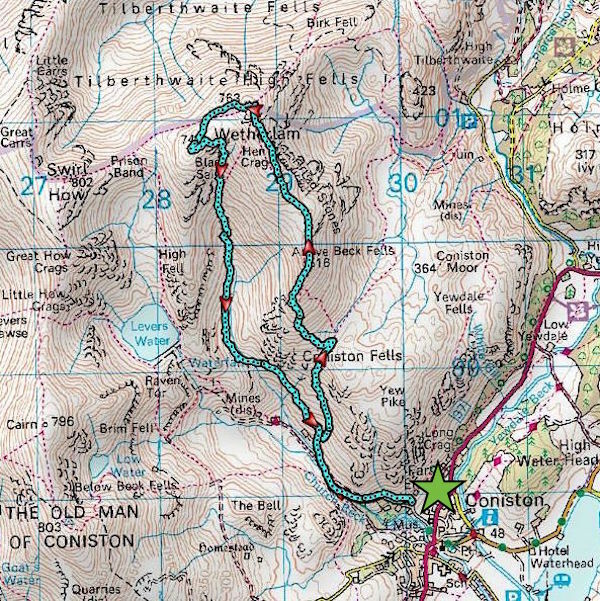 The route ahead, which is clear to see although we do keep having to skirt round the wetter parts of it. 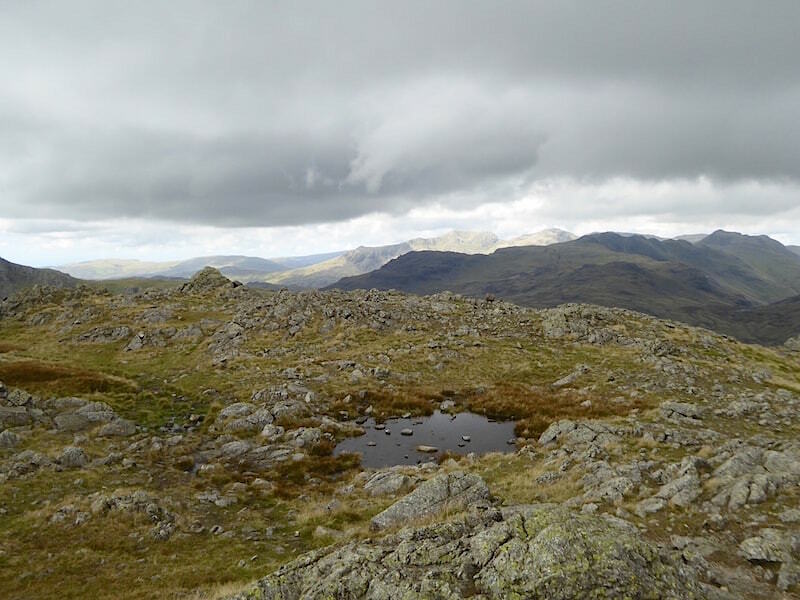 It may look like it but the summit of Wetherlam is not yet in sight. 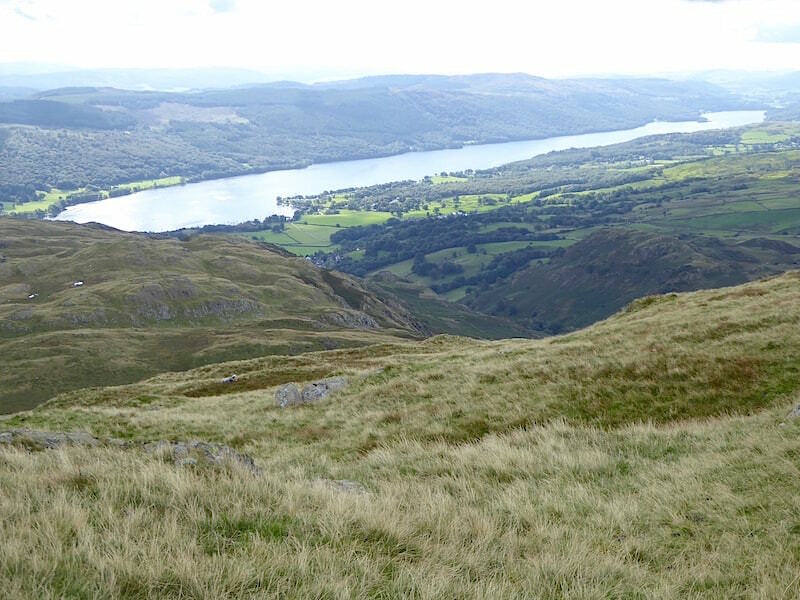 A look back at Coniston Water as we stop for a breather. 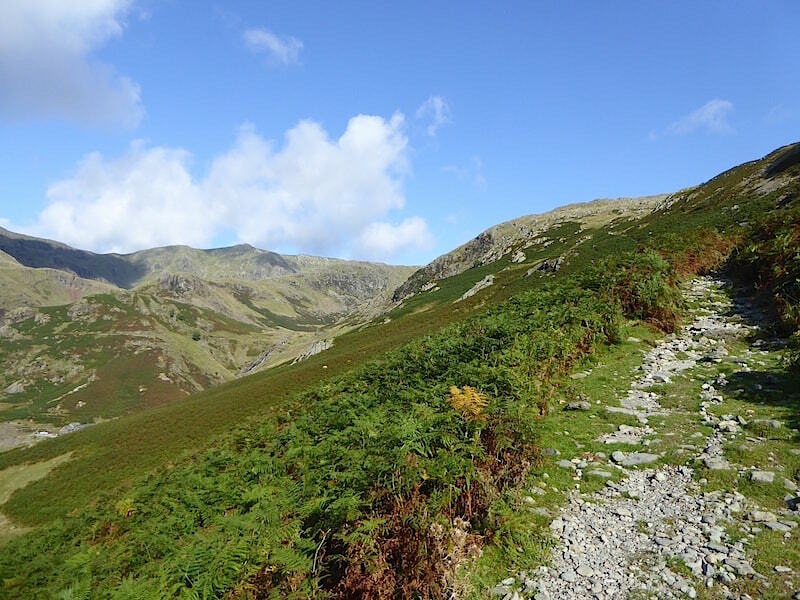 The route isn’t excessively steep but it climbs continuously with only occasional flatter sections where the legs can relax for a few yards before the next section of up. 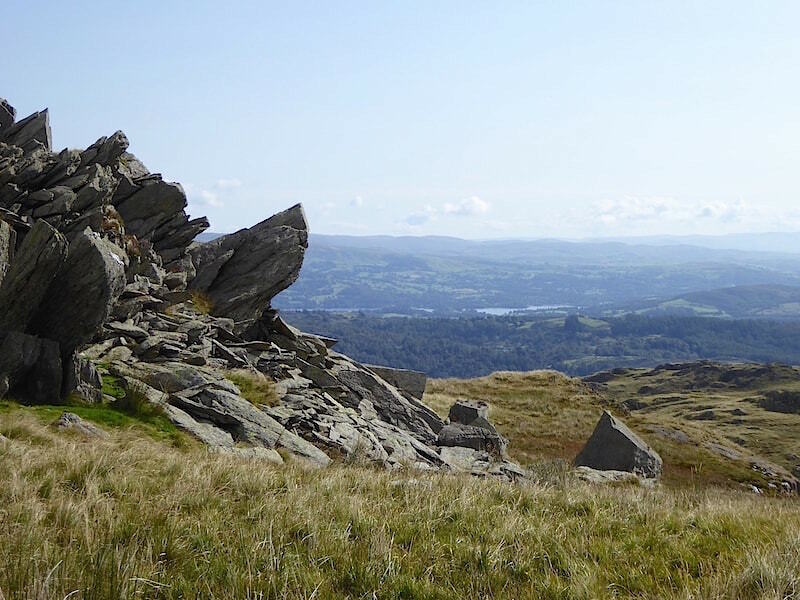 The merest hint of Windermere comes into view as we pass alongside this outcrop of splintered and jagged rocks. 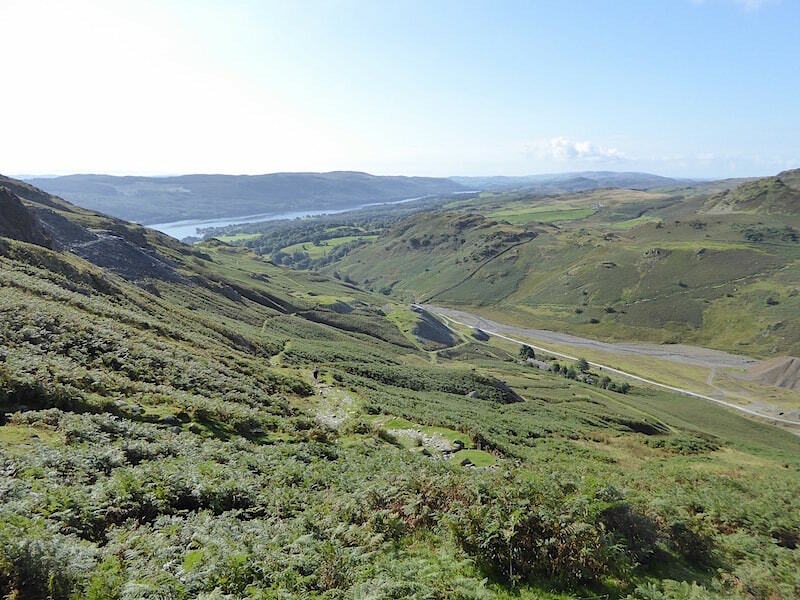 Another look back at Coniston Water and also at the gravel road now way below us in the Coppermines Valley. Some heavy dark cloud is beginning to arrive and the warm morning turns quite a bit cooler as it blots out the sun. J adds a long sleeved layer while I stick it out in short sleeves for a while longer. 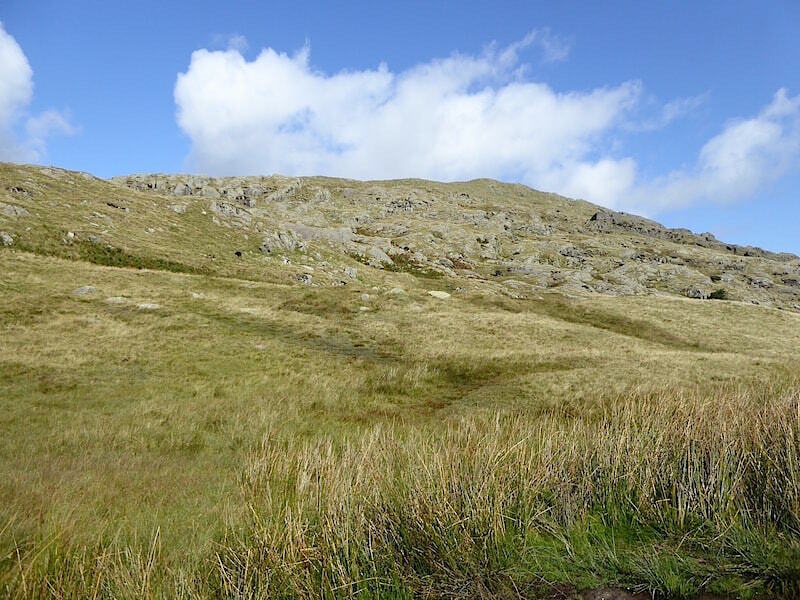 Coniston Old Man, now being draped in heavy shade, with Brim Fell next to it still enjoying some sunlight. 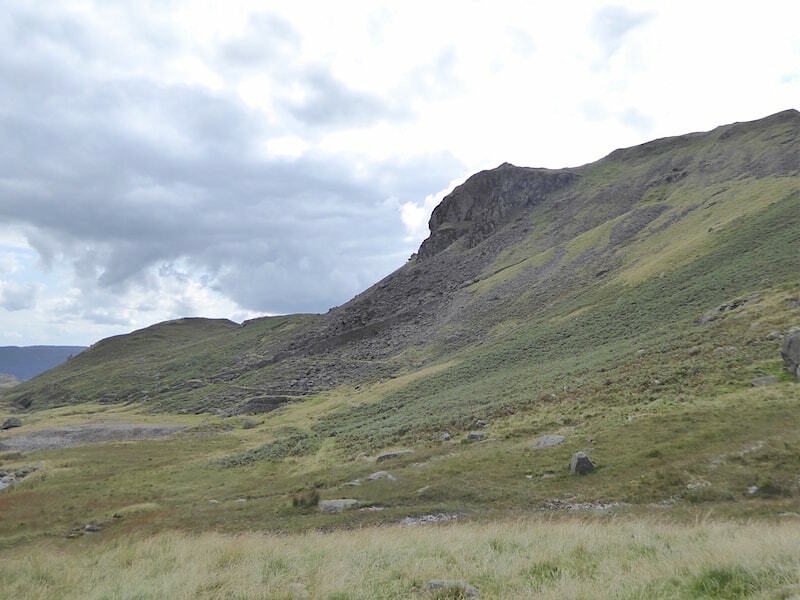 Below them and directly opposite us, in the lower foreground, you may be able to pick out a diagonal line running to the right of a large rounded crag. 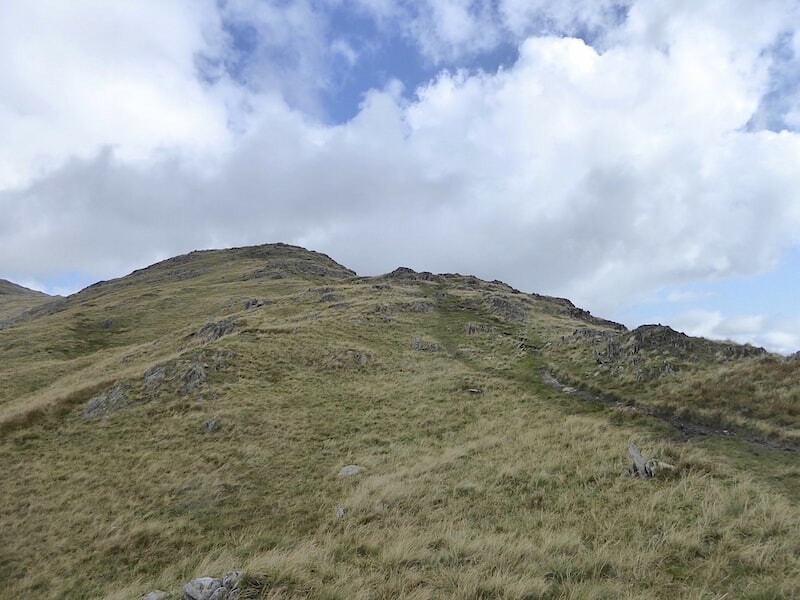 The crag is Kennel Crag and the diagonal line is the Thriddle Incline. 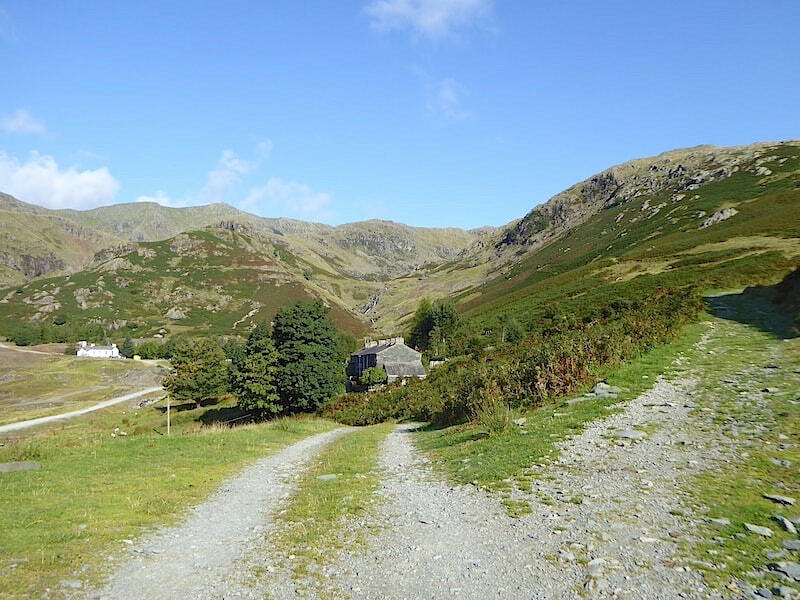 This was originally built to carry the winder and pumping rods up to the Thriddle Shaft Level higher up, nowadays its used as a route up to the grassy col just behind Kennel Crag and so gain the ridge up to Black Sails and eventually Wetherlam. Getting higher now and Black Sails comes into view across Red Dell. This gives us the chance to establish the location of the grassy terrace we need for our descent into Red Dell. 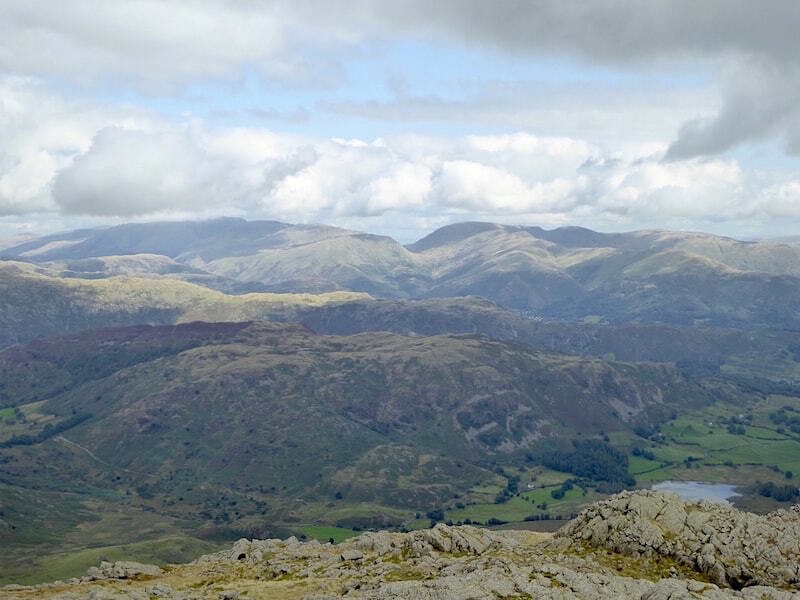 With that filed away for later …..
….. we turn our attention back to the climb and keep on carrying on. 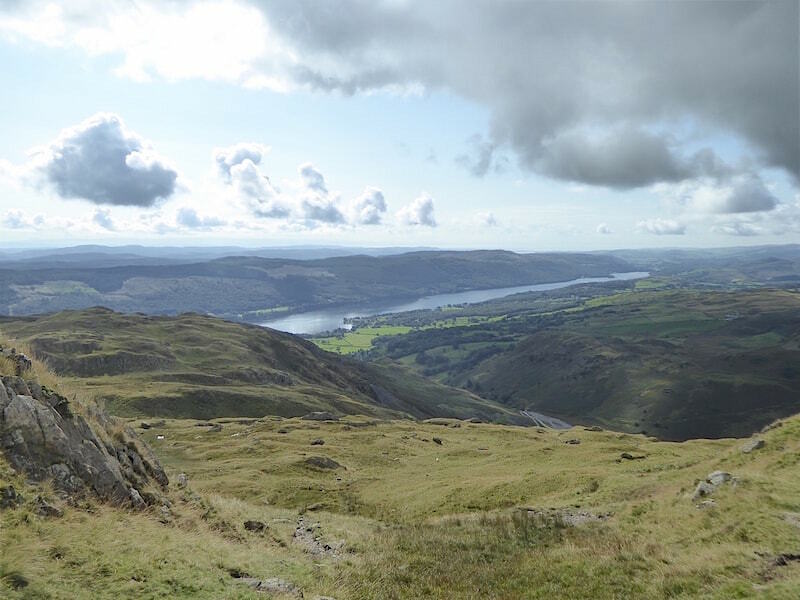 Coniston Water still has some sunlight on it but up ahead …..
….. its beginning to look ominous as the cloud begins to cover the skyline and we begin to wonder if we’ll be wrapped in it when we reach the summit. 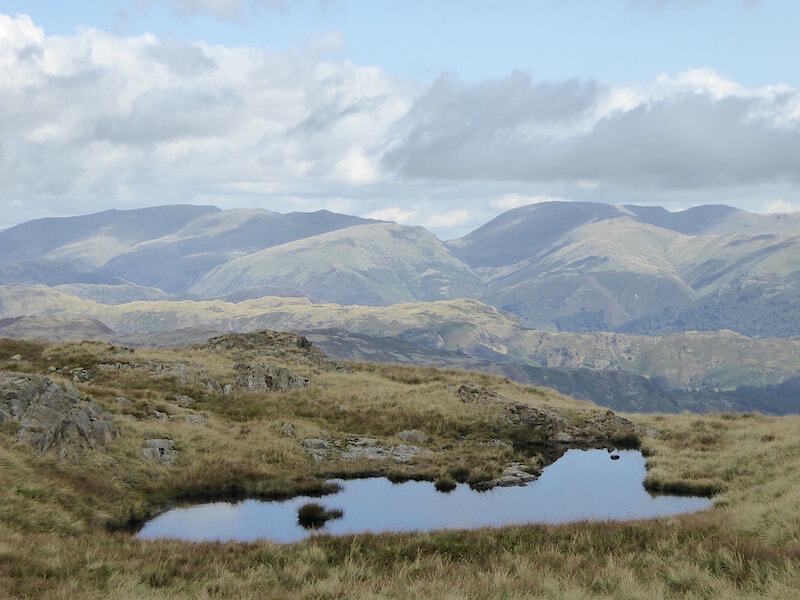 We reach the shallow depression containing a few unnamed tarns …..
….. one of which is abutted by a low wall of outcrop …..
….. while another offers an impressive view to the east of the Helvellyn range, on the left and the Fairfield group on the right. 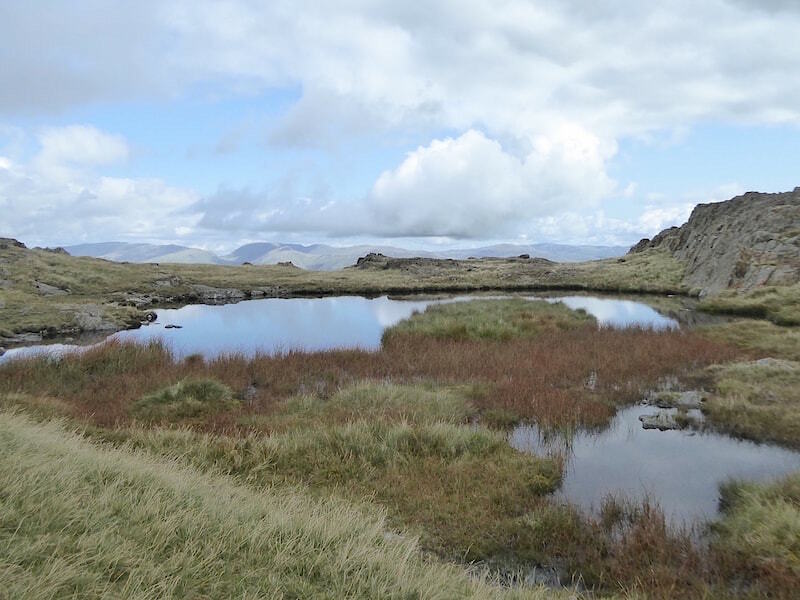 A look back at the tarns as we make our way up a steeper, but not too severe, section of the ridge. 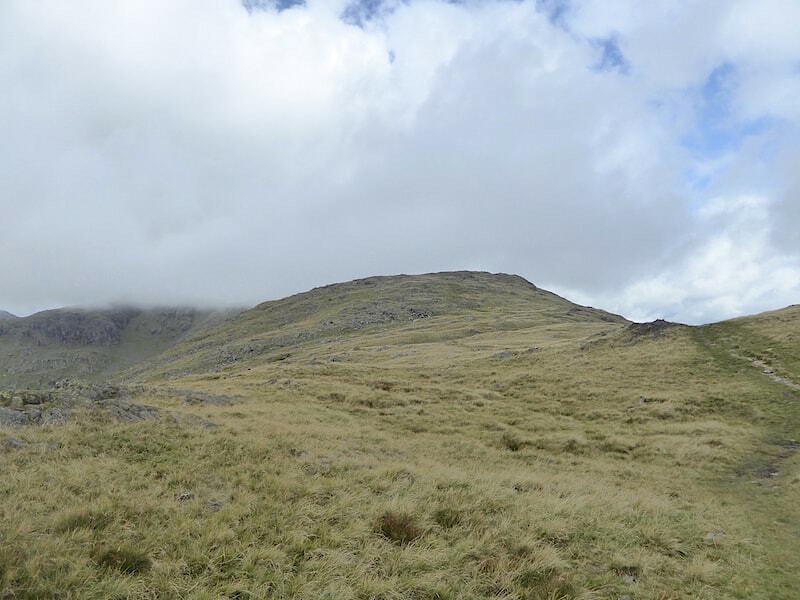 In the distance we begin to see the summit area dotted with tiny figures and at this point, with goosebumps appearing on my arms and most of the heavy lifting done, I add my long sleeved layer to keep my heat in and the cool breeze out. 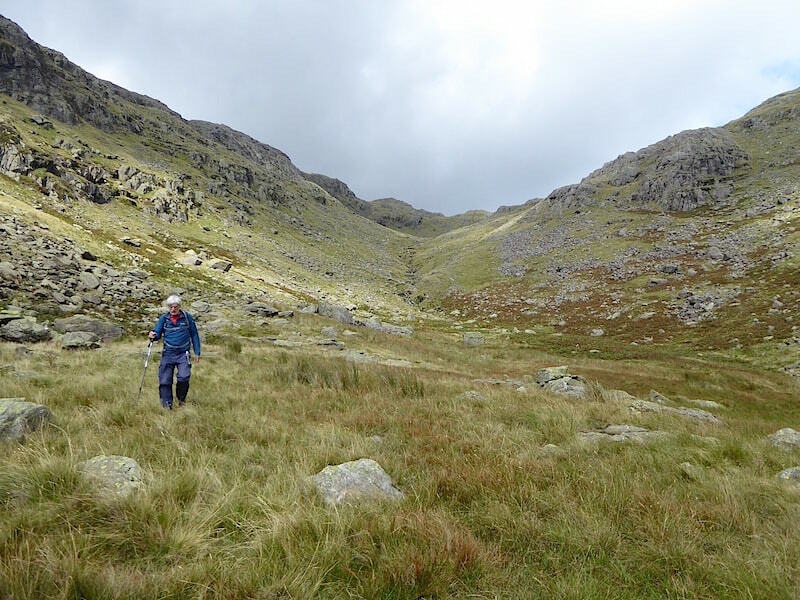 A look down one of the gullies as we cross over Hen Crag …..
….. and on our left Black Sails, above which is the peak of Swirl How with Great Carrs to the right of it and a lot of heavy grey cloud above everything. The blue sky and sunshine are spreading their cheerfulness over towards the east leaving us in the gloom. It was chilly beneath the cloud but it wasn’t low enough to wrap us in its clammy blanket so at least we had the views. 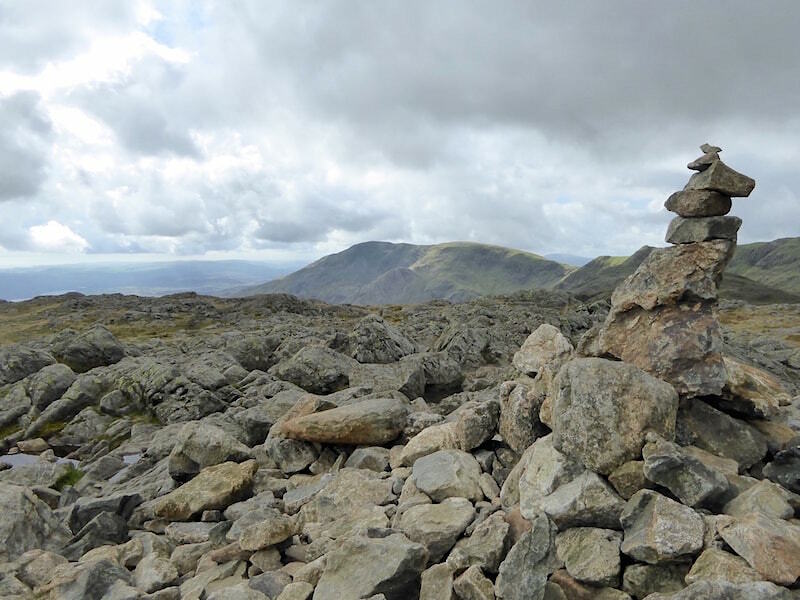 ….. and a view of Coniston Old Man from the precarious art installation atop the summit cairn. One strong wind will make short work of that so don’t give up the day job. 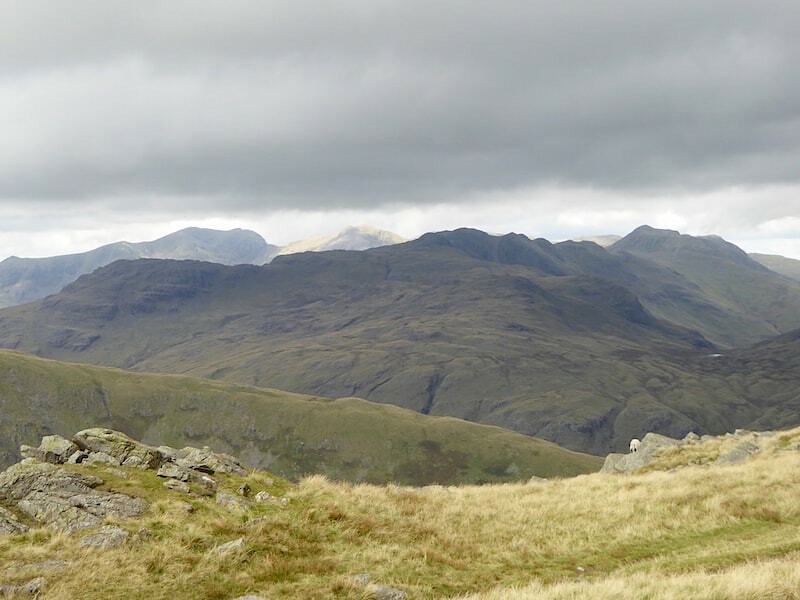 In the distance the Scafells are blessed with sunshine, in front of them and in deep shadow are Crinkle Crags and Bowfell. The cropped trousers were just the thing earlier on, now I’m not so sure. Its not warm enough to hang around so off we go heading for Black Sails. 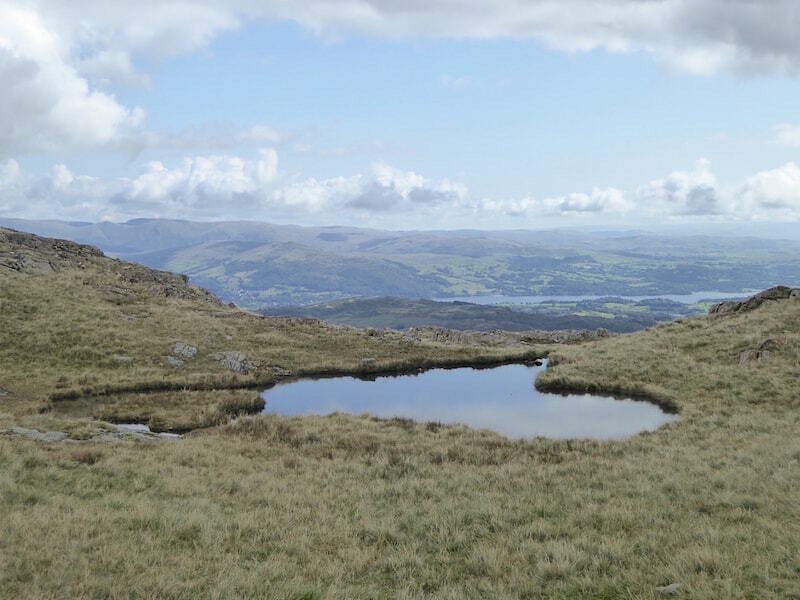 Wetherlam’s summit tarn is rather a feeble affair being little more than a puddle. 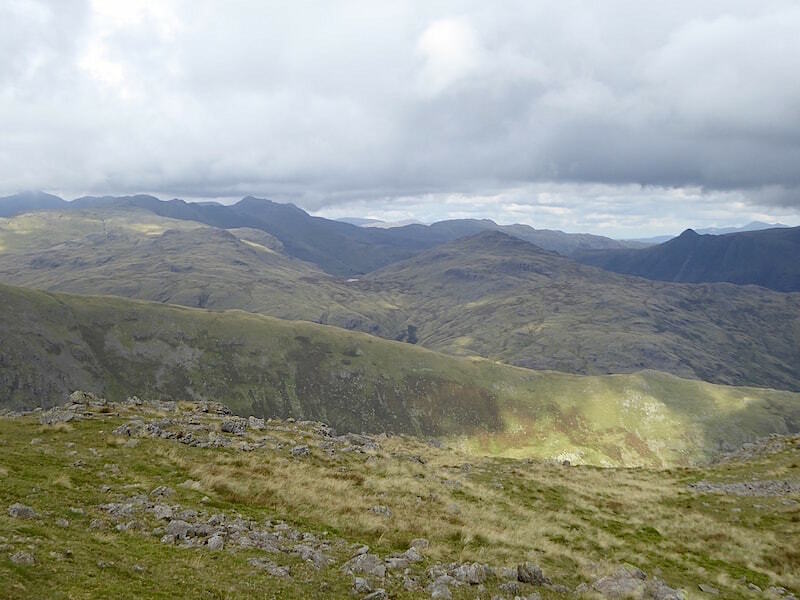 Beyond it to the left is Bowfell while over on the right is the equally recognisable Pike O’Stickle. 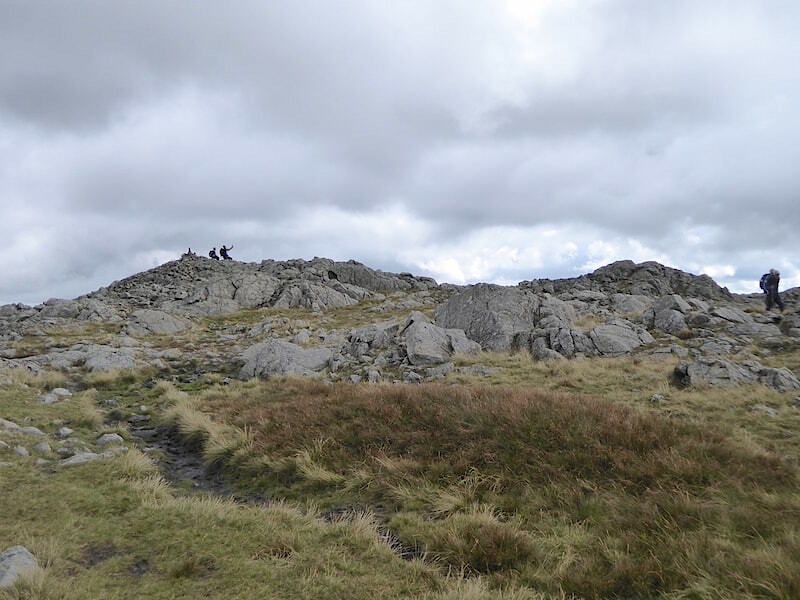 A look back at the summit where it appears to be selfie time for a newly arrived pair of walkers. A view of Black Sails across Red Dell Moss which we avoid crossing by using the Swirl Hause path, parts of which can be seen to the extreme right of the shot. 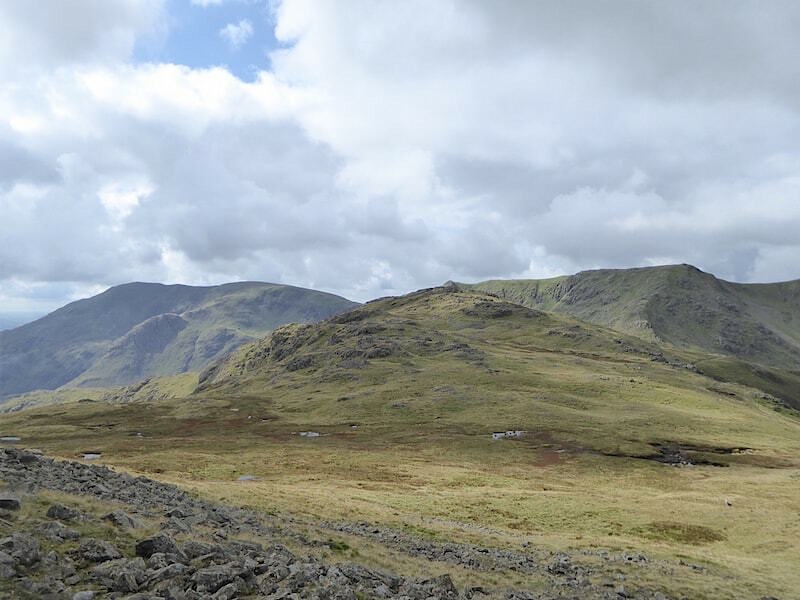 Crinkle Crags and Bowfell still in the shade but Scafell Pike behind is still sunny …..
….. with occasional patches appearing on Wet Side Edge, and Pike O’Blisco and Cold Pike just behind it. 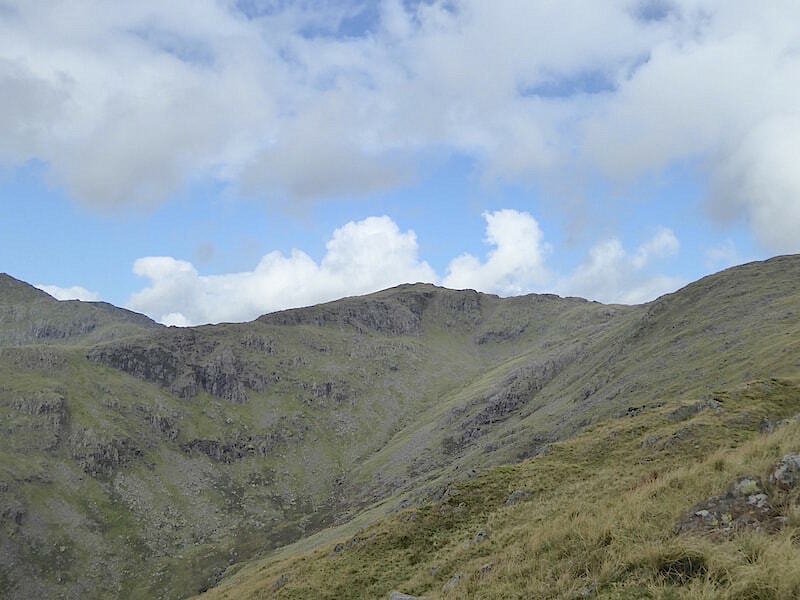 I take a look back at Wetherlam as we begin to climb up to the top of Black Sails. 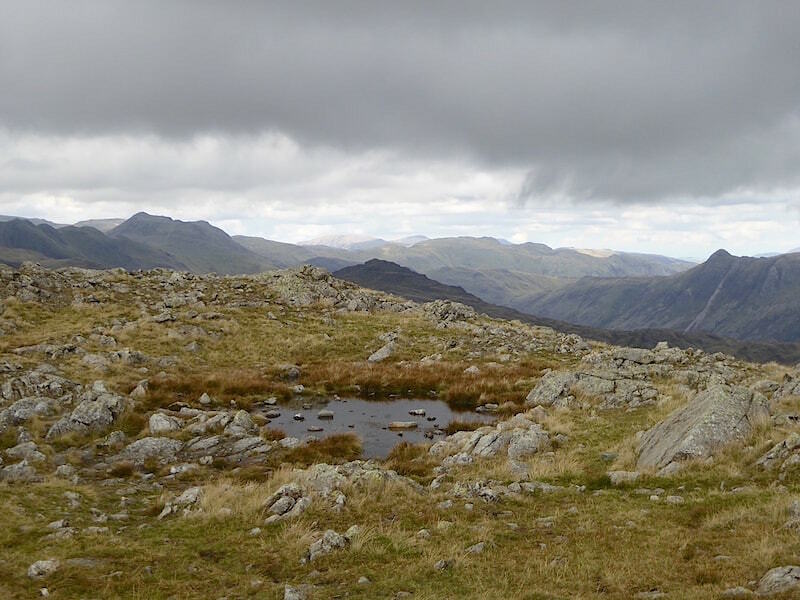 From Black Sails summit its looking a bit chilly over on Coniston Old Man and Brim Fell, and Levers Water looks particularly uninviting. Go away cloud, we’ve had quite enough of you now. It wouldn’t be so bad if it was doing something dramatic and/or interesting but its just hanging around and being annoying. From Black Sails a view of the Prison Band path up to Swirl How with Great Carrs over on the right. 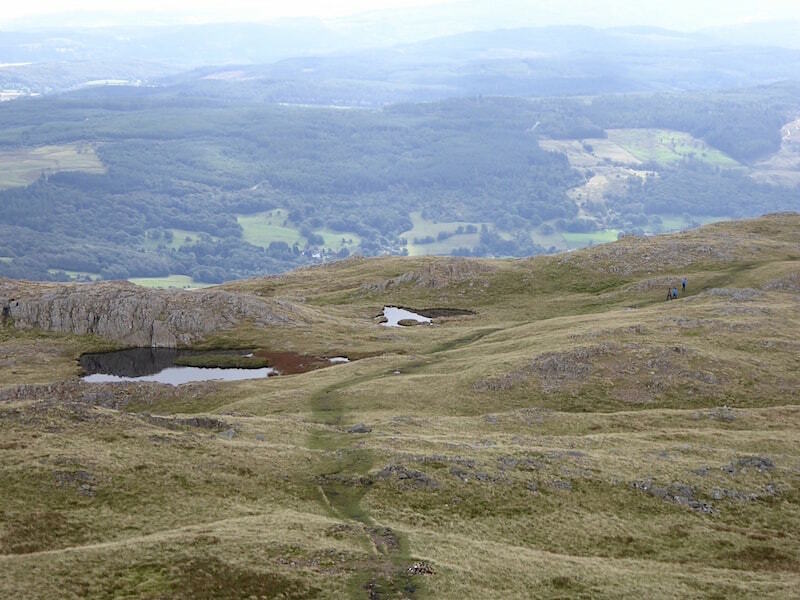 We drop down from the summit and hunt around for somewhere out of the breeze so we can stop and have something to eat. Lunch wasn’t an extended affair though, even with some shelter it was still too much on the chilly side to sit around for any length of time. Time to get moving we decided. 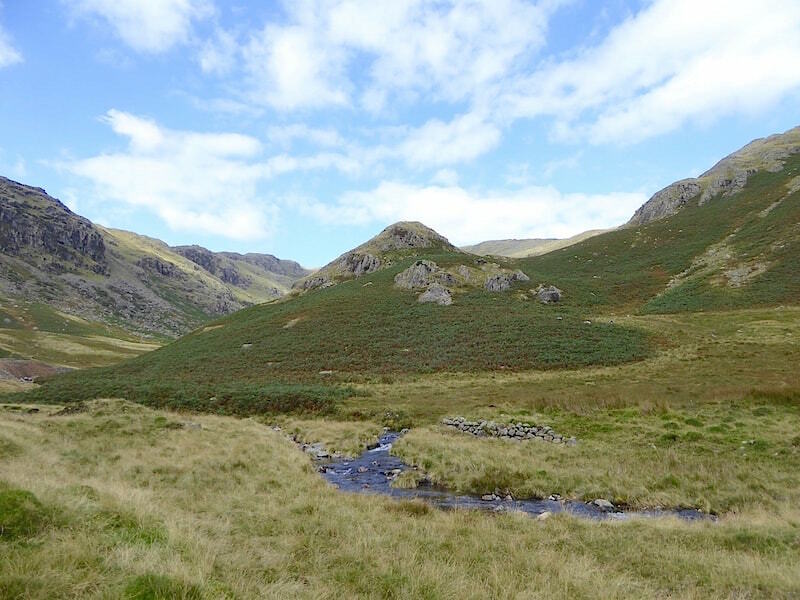 We skirted around numerous cliffs and outcrops until we found the grassy terrace we were looking for and began the descent into Red Dell. 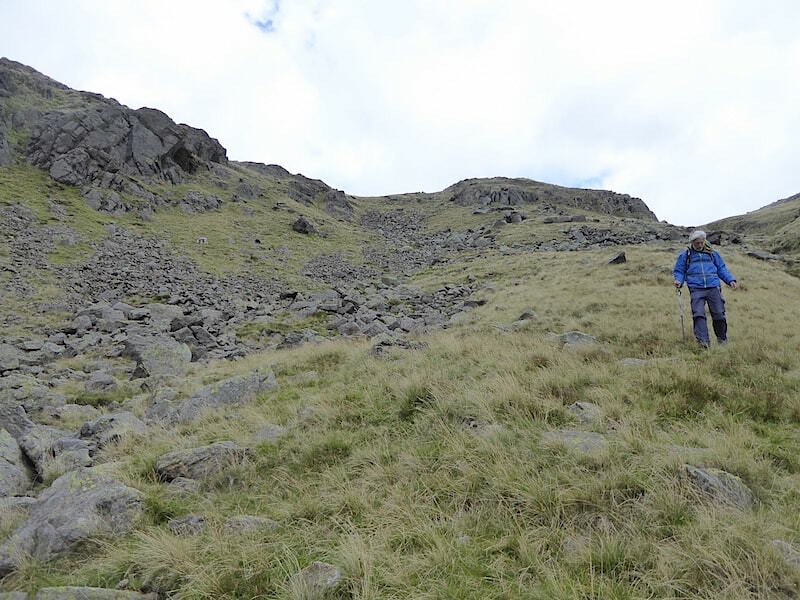 There were plenty of boulder fields to avoid, or to cross at their narrowest point, and the walk down, through long and lumpy grass for the most part, was very steep so we took it steadily and carefully. 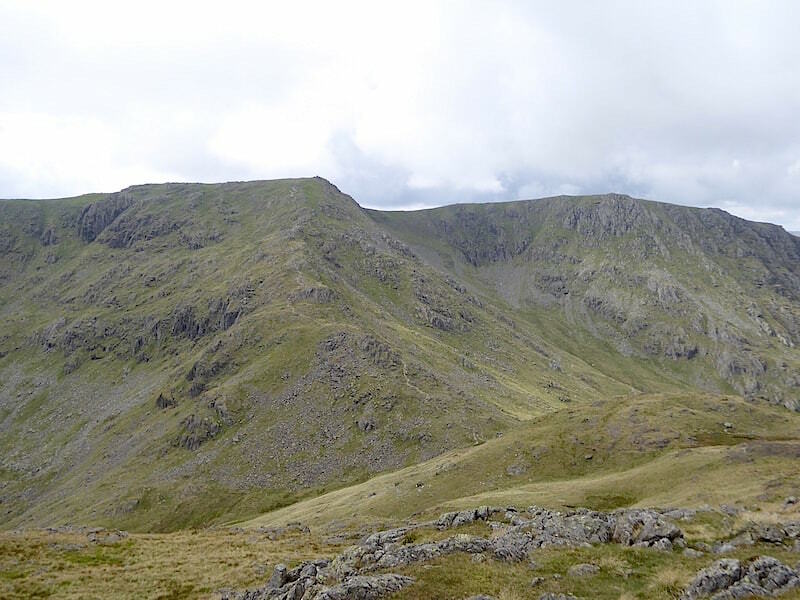 On the right is the ridge leading up to Black Sails and down at the bottom of it the knobbly cliffs of Kennel Crag. 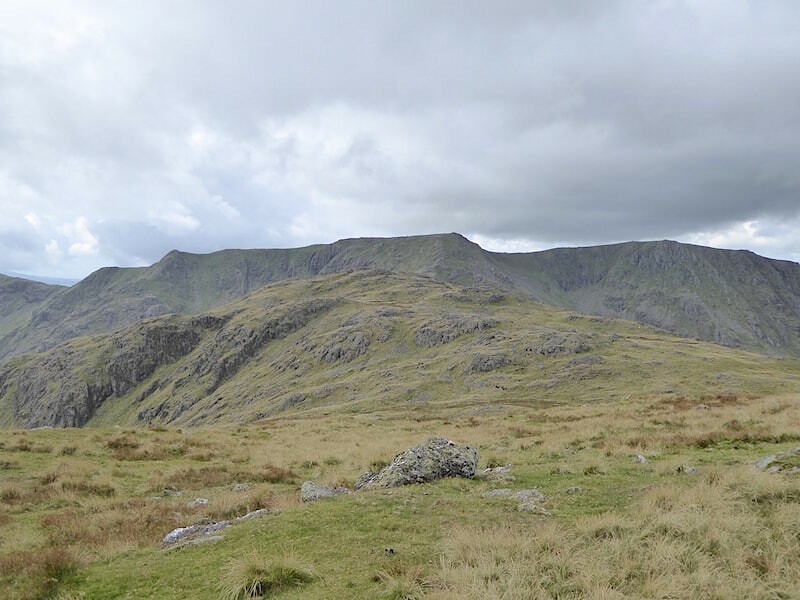 On the left is the ridge we walked up to the summit. A look back up from our descent with the foot letting its owner know that it still doesn’t care for steep and uneven descents. The jackets went on during our lunch stop on Black Sails and its still not warm enough to remove them. 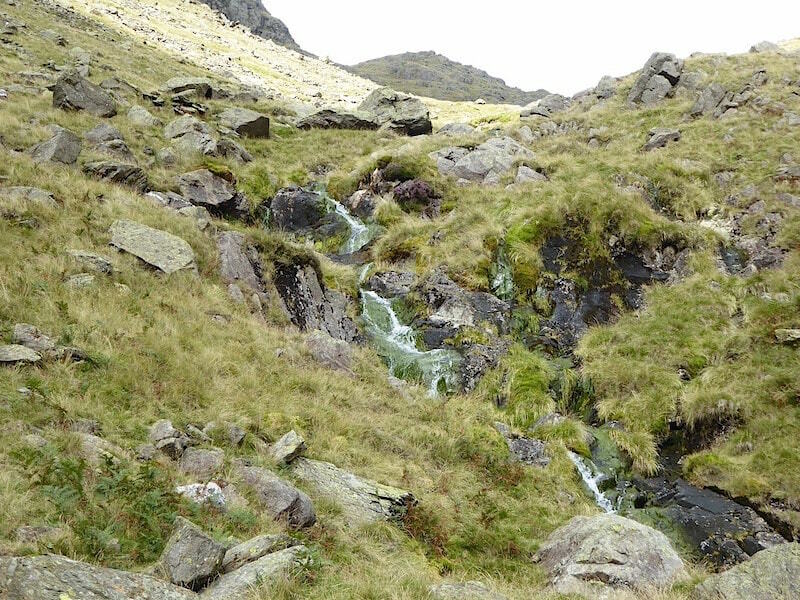 By the time we reach the cascades in Red Dell beck the worst of the steepness is behind us and the sun is out again …..
….. so the jackets come off. The cascades peter out and the ground becomes much flatter and wetter so we had to make plenty of detours to avoid the worst of the wetness. After taking this shot I turned around to carry on down the valley and noticed a couple just a few yards lower down sitting on some rocks to one side of the path. We thought they were having a lunch stop and not wanting to intrude we just carried straight on. Only a few paces past them we heard one of them call out to us so we walked back up to where they were sitting. 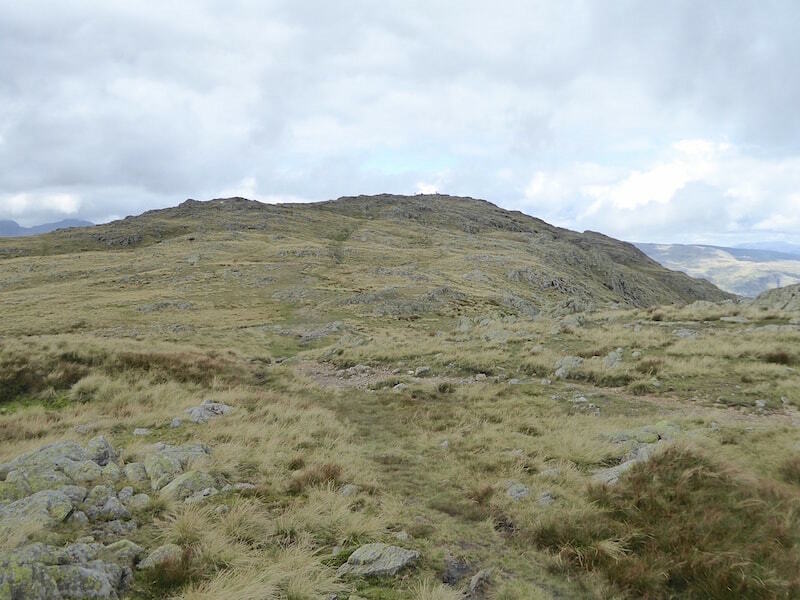 They weren’t lost but were wondering about what the route was like up Red Dell and how long it would take them to reach Wetherlam. We told them that it had taken us fifty minutes from the beginning of our descent to the point where we currently were, that there was very little, that we had been able to see, by way of discernible paths beyond the cascades and that the climb up was very steep over rough ground. 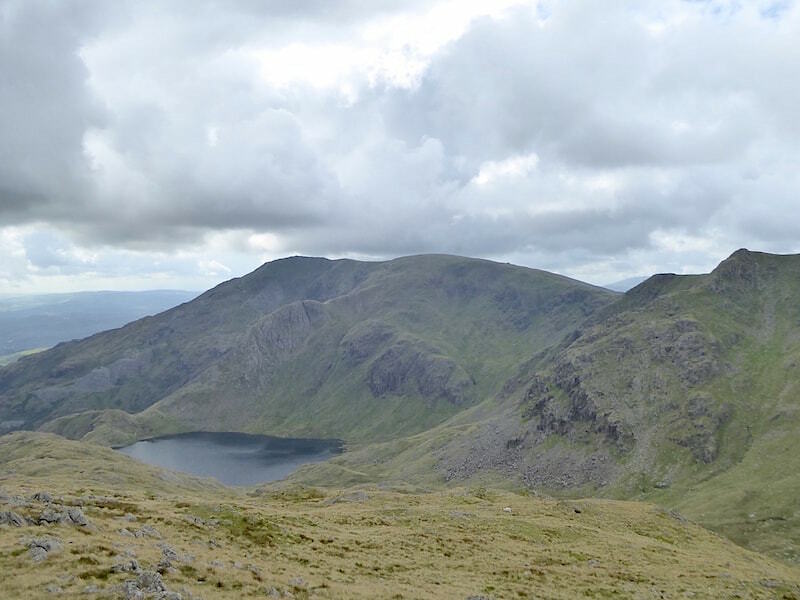 Our gps had given us a reading of 3.25 miles from where the car was parked in Coniston up to the summit of Wetherlam so that would have to be factored in too. 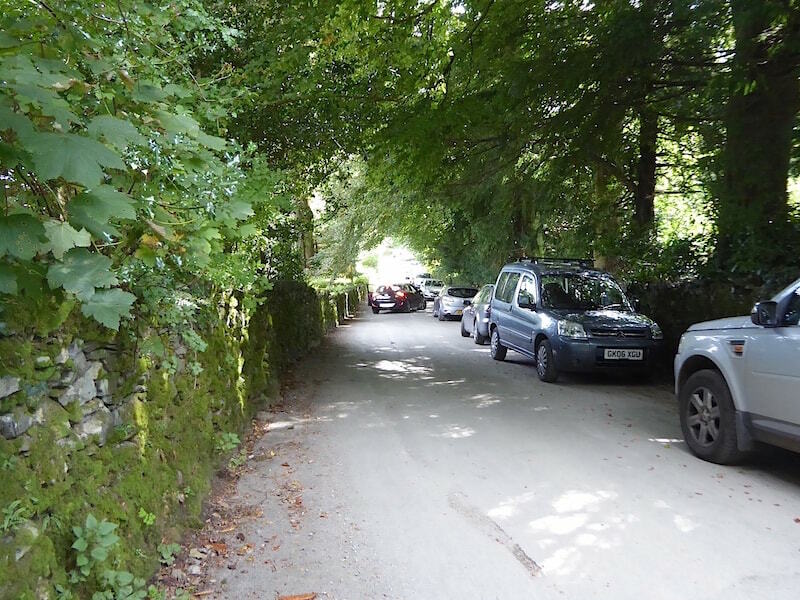 However, the weather had brightened up and there were still enough daylight hours left, as it was only just approaching 2.00 pm, so it looked as though it would be feasible until the man mentioned that he was in a car park in Coniston and the ticket expired at 4.00 pm. 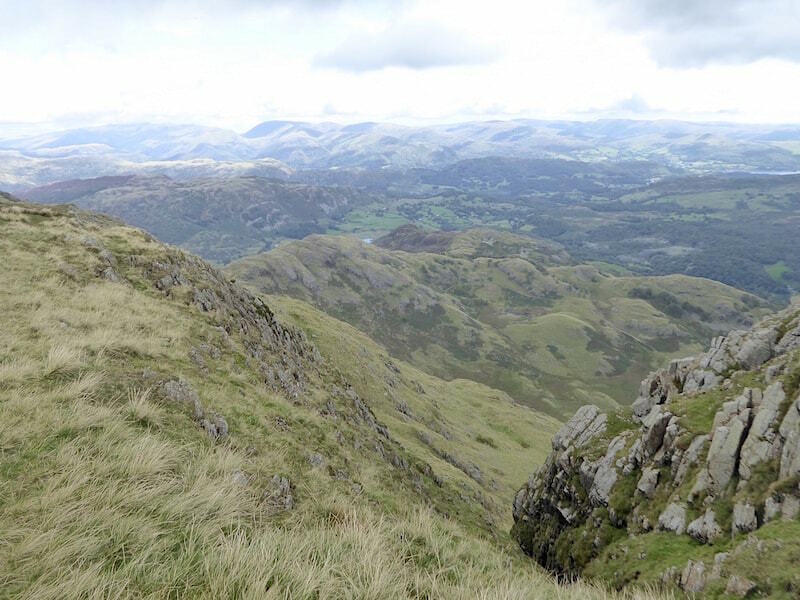 That left them with two hours to get up Red Dell, across to Wetherlam and then make the long walk back down the Lad Stones ridge to Coniston before some traffic warden stuck a fixed penalty notice on their windscreen. 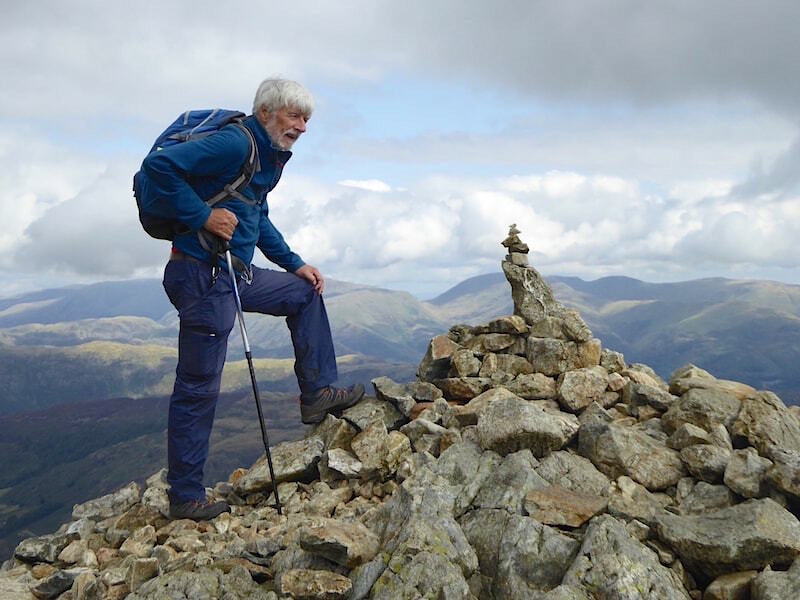 It began to look less likely given that they were possibly around, or beyond, retirement age and wouldn’t be scampering up Red Dell like a pair of twenty somethings. So all we could do was leave them to think about times and distances and then come to a decision as to how they would proceed. The man was grateful for the information we were able to offer him, disappointing though it might have been, and with good wishes on both sides we parted company with them. 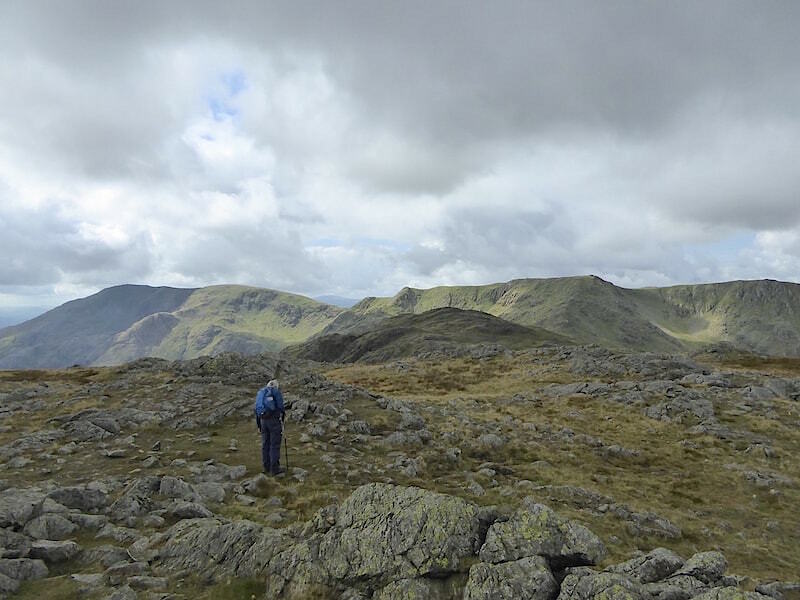 On we go across easier flatter ground now that we are in the valley bottom, although it was still very wet in many places, towards Kennel Crag with the diagonal line of the Thriddle Incline showing up below its craggy summit. Reminders of former mining activity are in abundance at the bottom of Red Dell and I did a little research to find out more since there was nothing by way of information around. 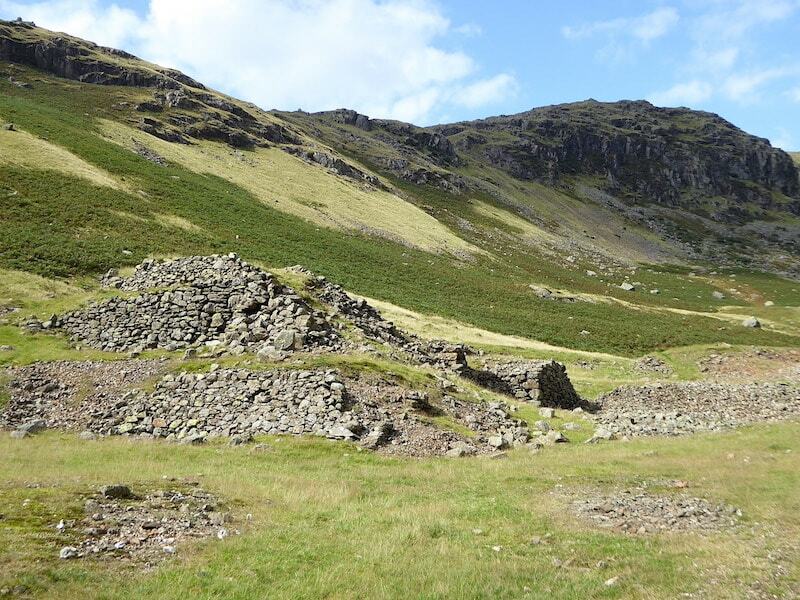 This turned out to be the ruins of what was once the Red Dell stamping mill and dressing floors. Looking back up the valley after putting the camera away I noticed the two walkers, who had stopped us a few minutes ago, now making their way back down towards us so they had obviously put Wetherlam on the pending list for another day. 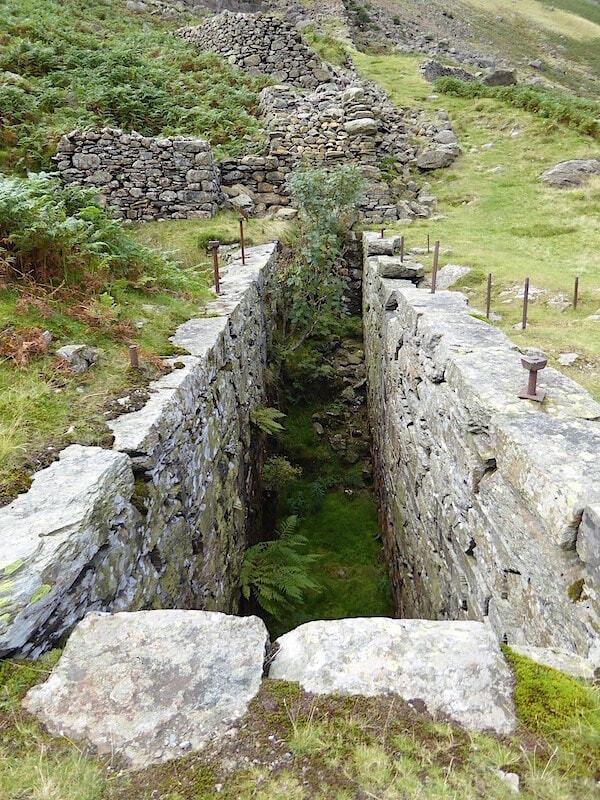 Looking directly up the Thriddle Incline from the ruins of the New Engine House Shaft waterwheel pit. The long gone Millican’s wheel, so named apparently after its operator, was central to all the pumping and haulage requirements for the New Engine and Thriddle Shafts. Peering down into the huge waterwheel pit. The wheel and associated buildings were dismantled in 1897 following the decline in the output of copper. Some of the workings had become very deep so the cost of pumping and maintenance began to outweigh the falling levels of production. The introduction of cheap ore from overseas proved to be the final straw and pumping was stopped. Some of the higher veins above the water table continued to be worked until the turn of the century, and from then on there were various attempts to revive the industry without much success and mining ceased completely in the 1940’s. A look back up the valley from the mining area and, as so often happens, the end of the walk sees a return of the blue skies and sunshine that we enjoyed this morning. Approaching the footbridge across Red Dell Beck where more derelict buildings stand alongside the path. 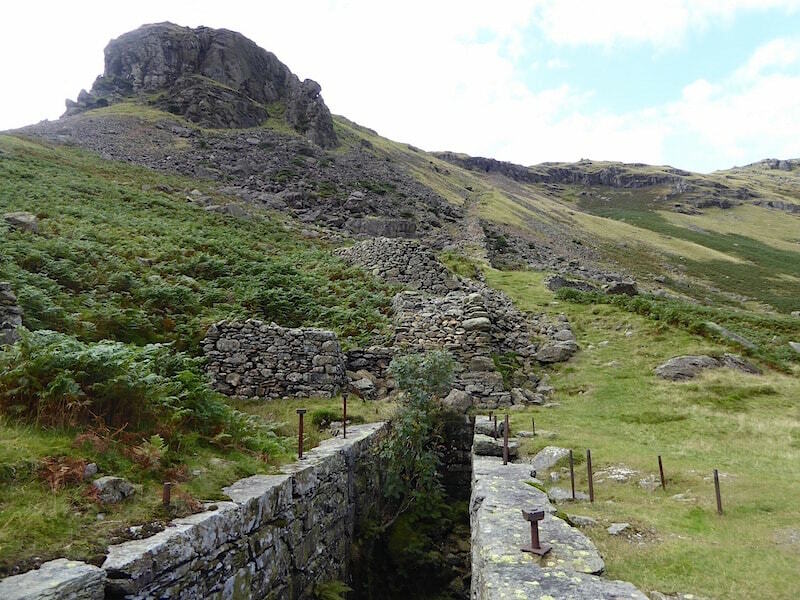 On the right hand side is the tower which carried the launder, or wooden trough, which carried the water to the Old Engine Shaft waterwheel. A huge 14 metre diameter wheel was used to power the pump and winding gear operating in the Old Engine Shaft, a shaft which had been sunk in the 1830’s. 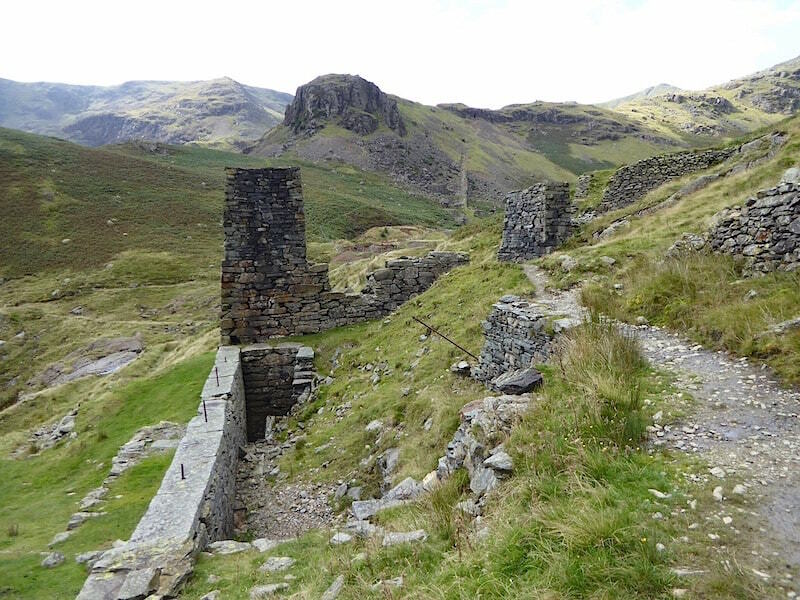 The launder tower and the waterwheel pit for the Old Engine Shaft which, together with the New Engine Shaft wheel directly opposite across the valley, finally stopped pumping in 1897. 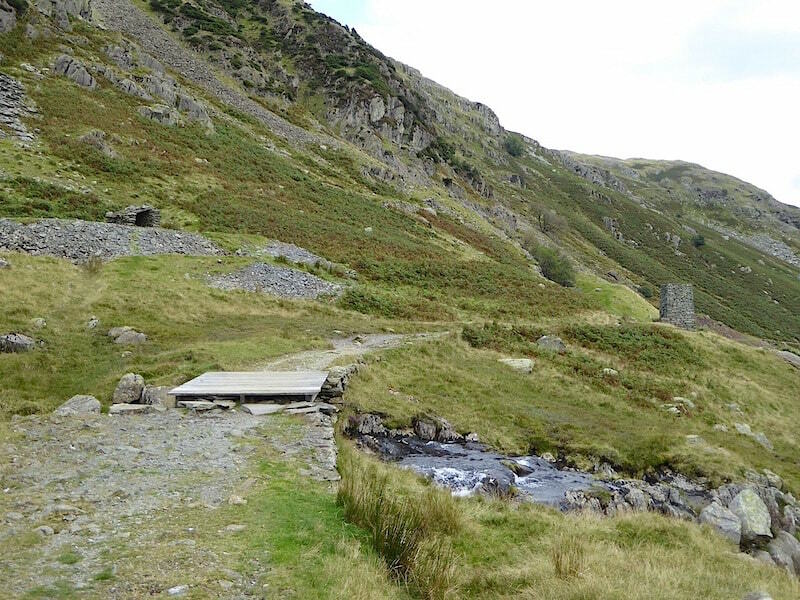 Further along the old quarry track are the remains of the East Bonsor Shaft waterwheel pit and engine house. This dates from the middle of the 18th century. 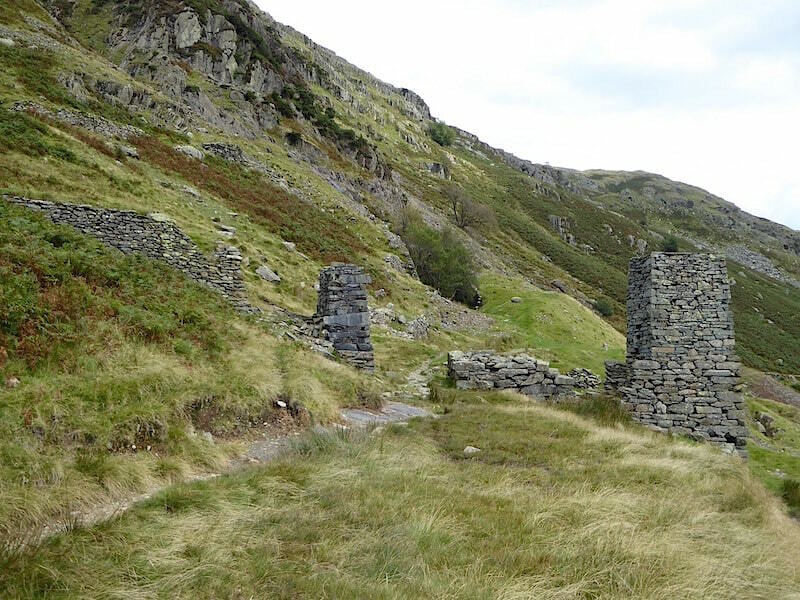 Immediately below us are the remains of the Bonsor Upper Mill with the foundations of demolished buildings clearly visible. Beyond them are a series of deep grooves which looked as if they may once have held water, possibly they were needed for a specific mining process. 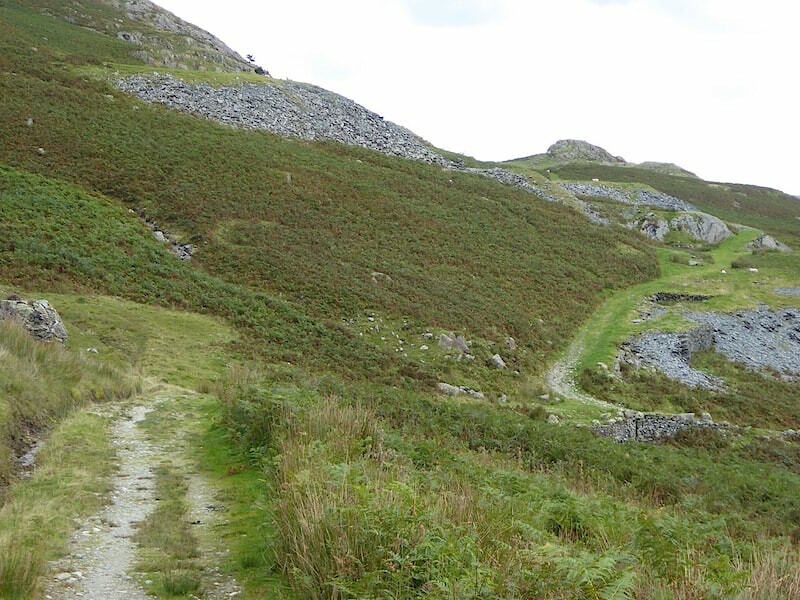 Our quarry track reaches the junction, the path running uphill on the opposite side is the one we followed for a short way this morning, before turning left just a few yards further along onto the rough path through the bracken just below the spoil heaps of the Low Blue Slate Quarries. 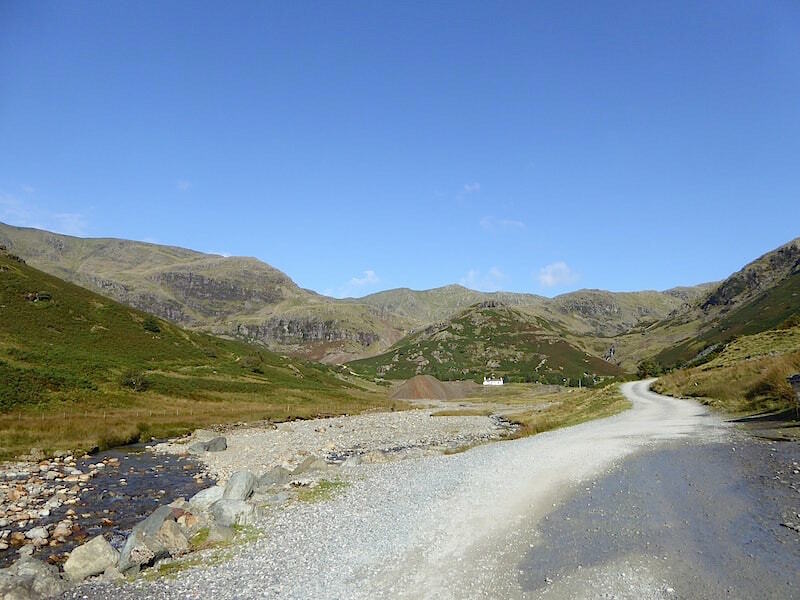 All we have to do now is follow the path as it curves around down to the gravel road in the Coppermines Valley and continue down that road back to where the car is parked. 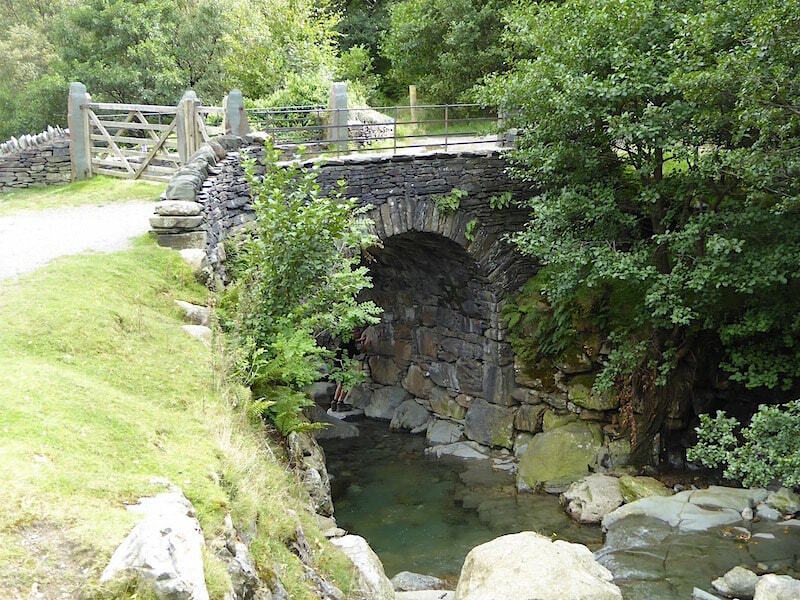 We pass by Miner’s Bridge on the way down where some numpty of a bloke, old enough to know better, especially as he had his young son with him, was attempting to walk under the bridge. You could tell the young lad was bordering on scared from the tone of his voice as he kept repeating Daaaad, Daaaad. I walked swiftly on, determined not to hang around and wait for the inevitable to occur. Back at the top of the lane which is now packed with vehicles and the usual shenanigans as drivers attempt to shoehorn their way out and back down the road. Ours is the grey one over to the right and our early arrival had given us the chance to turn it around there and then. Its pointing the right way so the gear gets stowed in the boot, in we get and off we go with no need for any faffing around. A grand walk out, but a shame that the weather couldn’t quite behave itself for the whole day rather than just the top and tail of it.